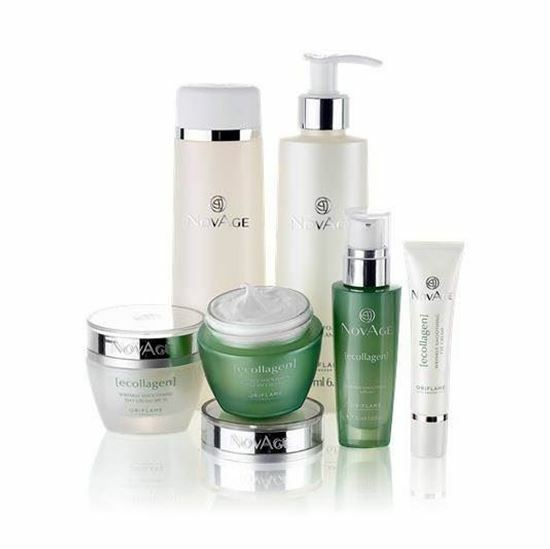 The NovAge Ecollagen Skin Care Set of six products is designed to follow the Oriflame Youth Enhancing Skin Care Routine. Cleanser : CellActive Technology effective action on the skin. Toner : The unique blend of hydroxy acids and humectants in CellRenew Technology exfoliate away dull, dead skin cells, promote cell turnover and renewal, moisturise and help to keep the skin hydrated. Wrinkle Smoothing Eye Cream : Patented Tri-Peptide Technology boosts cellular energy, provides antioxidant protection against UV radiation and stimulates collagen synthesis to restructure the extracellular matrix and plump wrinkles from within. Wrinkle Smoothing Serum : Triple Perfect Complex exfoliates away dull, dead skin cells and promotes cell turnover and renewal. Wrinkle Smoothing Day Cream SPF 15 & Night Cream : Solanaceae Plant Stem Cell extract stimulates collagen synthesis and also protects the integrity of the skin's collagen network by neutralising the enzymes which cause its degradation.